Liverpool Under-18s coach Steven Gerrard admits he is still trying to adjust to the way the club’s academy system works. The former Reds captain guided his young side to victory over Manchester United in the UEFA Youth League to set up a quarter-final next month against Manchester City. 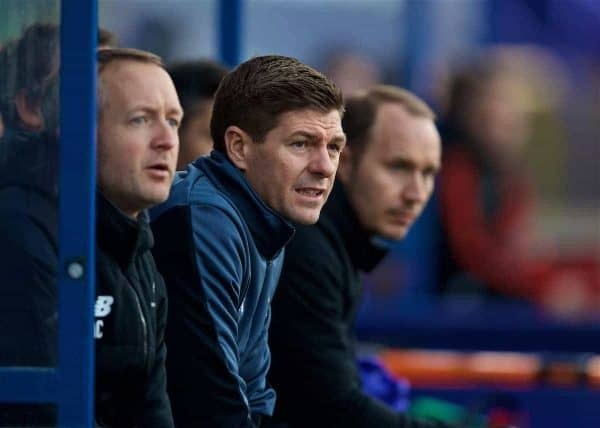 It ended a run of four defeats for Gerrard, in his first season in charge of the youth side, and he accepts he is still getting his head around the priorities of working in the academy. “In terms of the (under) 18s and 23s it has been a tough few weeks in terms of results, they haven’t gone our way. The lads have had a tough month and so have the staff,” said the former midfielder, whose side have slipped to third in the Under-18 Premier League. “It has been a test, it has been challenging, because things change from the January window as people go out on loan, people move up to Melwood and you don’t have the same players you had for the six months. “Critch (under-23 coach Neil Critchley) has his pick from my players, which I have to accept, and I have the pick from the 16s. “Some of my players are not ready for 23s, which can be frustrating for Critch, and some of the 16s are maybe not ready for 18s but it is what happens at academy level so I have to adapt to that. “If it was my way I wouldn’t let any of them go, I’d want them to compete for the league but that’s selfish because players have to get different experiences higher up and players have to go out on loan.